Hei, oikein mukavaa Helluntaita! Tervetuloa kesäkuun Penny Black and More haasteen pariin. Vietämme 7:ttä synttärijuhlaa! Huomaa, että voit itse valita palkinnon kahdesta vaihtoehdosta. Aiheemme on helppo: Kaikki käy, kunhan käytät leimasinta. Hello, first Sunday of the month - it's time for new Penny Black and More June Challenge. Easy theme "Anything goes - with the stamp". And it's also our 7th birthday! 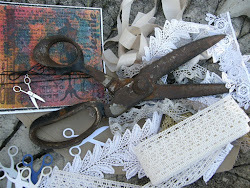 Our sponsors are Penny Black with fabulous rubber stamp set or Tattered Lace mini cutting machine. Please check how to win one! 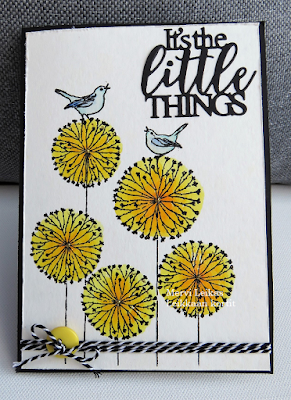 A very pretty CAS style card Mervi and such sweet little birdies. Enjoy the rest of the weekend, hope it warms up for you. What a beautiful stamp, and love your colors. Beautiful card! I haven't seen this stamp before, I love its size and it's perfect for so many occasions! Beautiful card, Mervi. Delightful image. Love the colour scheme. oh, so bright and cheery and pretty! Lovely CAS card - didn't recognise the stamp. Lovely sunny flowers. Nice yellow tone. It is indeed and this is one of them - such a happy card. Thanks for sharing your creativity with us at Crafting with Dragonflies. Cute creation Mervi, love the stamping and bold look.